Leaders think differently than the rest of the population. They think in 6-Dimensions to attract the life that they want. 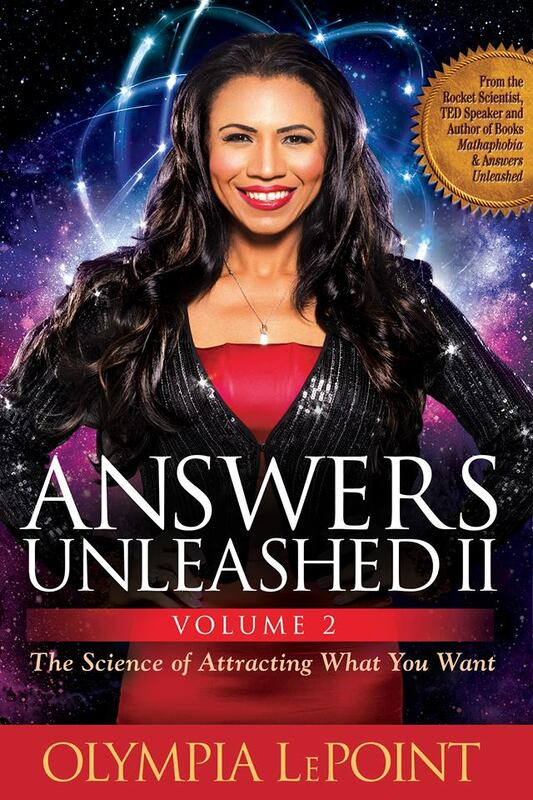 As the second book of the Answers Unleashed Book series, Answers Unleashed II : The Science of Attracting What You Want explains the “Science of Attraction” and how you can attract the life that you want. Your dream career. Your soulmate relationship. Your investors. It’s not magic. It’s more practical than “The Secret.” It’s your breakthrough Science + Faith = Your “6-Dimensions of Thought.” This book is not for everyone! The book is for leaders who want to transform their lives and magnetize supportive success. With LePoint’s Thought Science, Olympia LePoint reveals that leaders think in six dimensions, and they can transform their lives through making 6 important decisions from the past to alter the future. With the “Triabrain” and “Triabrain Theory of Relativity” developed in her second book Answers Unleashed: The Science to Unleash Your Brain’s Power, Olympia LePoint expands her science theory in revealing how atoms, planets, solar systems and your thoughts all have the same orbiting fields that expand energy for unstoppable growth. But these fields can become warped with toxic thoughts. As a human atom with orbiting thought fields around you, leaders generate the energy needed to transform situations. It’s no longer “a secret;” with “The 6 – Dimensions of Thought,” you attract the life that you want. Visit AnswersUnleashed.com for more information.